• One feature of Kearsney College’s vision is ‘to contribute to our country by providing ethical citizens’. • An aspect of our mission is to ‘inspire a deep respect for creation and humanity’. • We are boys of integrity, honesty and honour. • We do not cheat, lie, steal or bully and do not tolerate those who do. • We boys uphold all the traditions of the College. 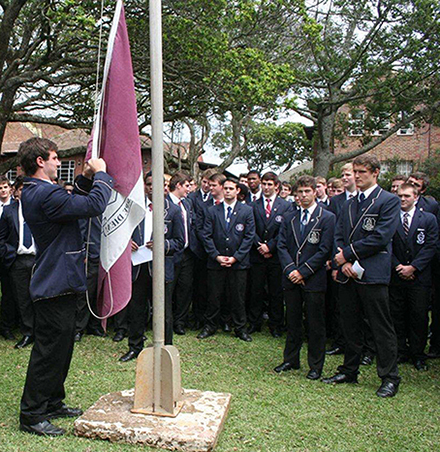 The principles of the Honour Code are not simply rules to follow in order to be considered a true Kearsney boy. The Honour Code is a means of ensuring the highest standard of personal integrity. The code is the boys’ own approach to dealing with misconduct that is essentially moral in character. The upholding of the Honour Code is entrusted to the Honour Council consisting of the Head Boy, the Deputy Head Boy, the five Heads of Houses and the Chairman and Vice-Chairman of the Kearsney Council guided and overseen by the Deputy Headmaster in charge of Discipline. Members of the Honour Council are expected to uphold the Honour Code by personal example and by educating the boys of the College in the finer points of honourable behaviour. They are also responsible for dealing with violations of the Honour Code. The following offences are considered to be violations of the Honour Code: lying, stealing, cheating, bullying and the willful disrespect for or defiance of Kearsney school boy traditions. • Lying includes willful distortion or misrepresentation. • Stealing includes ‘borrowing’ another’s property without his or her permission. • Cheating includes taking any unauthorised notes or aids into an examination or test or leaking information about the contents of an examination or test to pupils who still have to write it. • Plagiarism includes passing off another’s work, words or ideas as one’s own. • Bullying includes physical, emotional, verbal, and psychological. • A list of relevant traditions is available on the College intranet. A boy who reportedly violates the Honour Code may be required to appear before the School Disciplinary Committee or Honour Council (six of whose members will constitute a quorum). The School Disciplinary Committee consists of the members of the Schools Executive Management and the Honour Council will normally be chaired by the Head Boy (or his designated deputy or a prefect). Should the Deputy Headmaster be unable to attend the meeting he will deputise another member of the College Executive Committee to do so. If a Kearsney pupil lies, cheats, steals or bullies and shows willful disrespect of Kearsney school boy traditions he will appear before the Honour Council. If a Kearsney pupil cheats, steals or bullies he will be also dealt with under the School Code of Conduct and punished accordingly. • The transgressor will wear Kearsney Number One uniform without blazer and tie, with the top shirt button fastened for a period of time to be decided by the Council determined according to the seriousness of the violation. • The transgressor will lose a number of House Points for his respective House depending on the seriousness of the violation. • He will lose the privileges of his current grade for the duration of the sanction. • He will need to apologise, in person, to whom he has transgressed in the presence of the Master in Charge of Discipline. • The transgressor could be given an internal suspension depending on the seriousness of violation and also the number of times he has appeared before the Honour Council. A violation of the Honour Code which constitutes an offence in terms of the College Code of Conduct (cheating, stealing or bullying) will result in standard disciplinary action and punishment. These Honour Code Violations may also be referred to the Honour Council.